This large pastel, measuring 32 x 41 inches was created by Guy Hoff for the cover of the January 24,1931 issue of The Saturday Evening Post. This beautiful young woman has a hair style, dress, and jewelry that are all classic of this time period, though she seems to be unaffected by the grasp of the Great Depression which was in full swing at the time. 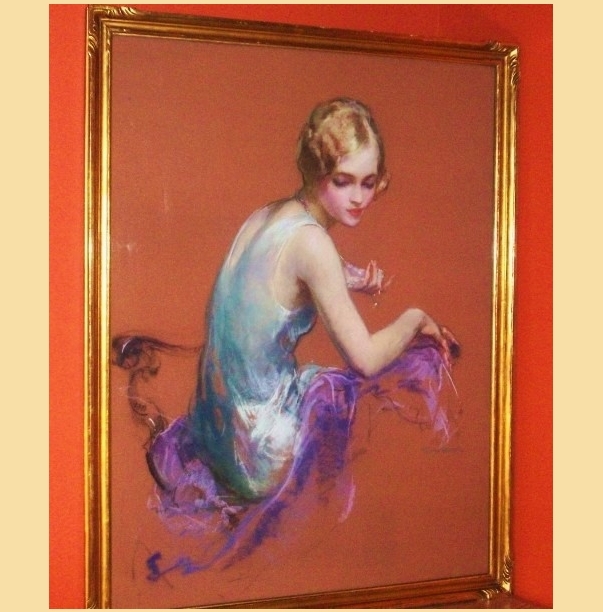 The background of this pastel is done in a perfectly even coat of peach pastel, which lends itself well to the teal and purple tones on her dress. Coincidentally, Hoff created another cover illustration for the July 30,1932 issue of The Saturday Evening Post using the same model, possibly wearing the same dress, but in a different pose. Guy Hoff was born in Rochester, New York in 1880. He attended the Art School of The Albright Gallery, in Buffalo and the Art Student's League in New York City. In New York, he designed program covers for the Shubert Theatres and then sold his first cover to Smart Set, which propelled him to the national scene. He painted cover illustrations for The Saturday Evening Post, Liberty, Judge, Colliers, and The American Magazine. He also did advertising illustrations for Proctor & Gamble, Lux, and Ivory Soap, among others. He was a member of the Society of Illustrators, and participated in the WPA/Federal Art Project. He exhibited at the National Academy of Design and the Society of Illustrators. Guy Hoff passed away in 1962.